Another type of lipid in the membrane is cholesterol. The amount of cholesterol may vary with the type of membrane. Plasma membranes have nearly one cholesterol per phospholipid molecule. Other membranes (like those around bacteria) have no cholesterol. 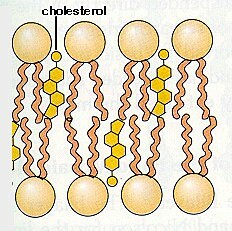 The following figure shows the steroid structure of cholesterol. The non-polar and polar regions are also illustrated in b) (Figure modified from Alberts et al. Molecular Biology of the Cell, Garland Publishing, N.Y., 1994, Third Edition, Figure 10-8. The cholesterol molecule inserts itself in the membrane with the same orientation as the phospholipid molecules. The figures show phospholipid molecules with a cholesterol molecule inbetween. Note that the polar head of the cholesterol is aligned with the polar head of the phospholipids. Figure modified from Alberts et al. Molecular Biology of the Cell, Garland Publishing, N.Y., 1994, Third Edition, Figure 10-9; or Wolfe S.L., Molecular and Cellular Biology, Wadsworth Publishing Company, 1993 (figure below). They immobilize the first few hydrocarbon groups of the phospholipid molecules. This makes the lipid bilayer less deformable and decreases its permeability to small water-soluble molecules. Without cholesterol (such as in a bacterium) a cell would need a cell wall. Cholesterol prevents crystallization of hydrocarbons and phase shifts in the membrane.